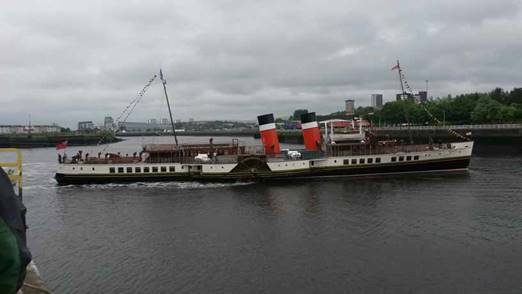 Waverley looked splendid alongside Pacific Quay dressed overall to mark her 70th anniversary season when we boarded on Friday 26 May 2017. The sailing was due to take us to Greenock, Largs, Dunoon and Loch Long. Unfortunately, things did not go to plan. At our first call at Greenock we were surprised to see the engineers run out the water hose. After about 40 minutes we sailed on to Largs but there was still a need to take more water. In view of the mounting delays, Captain Cochrane decided to curtail the cruise at Largs which was a great pity as there were good numbers on board in the beautifully sunny and warm weather. During the 2 hours sitting alongside waiting our scheduled departure time, the technical issue was resolved and the paddler could return to Greenock and Glasgow at full speed. If the issue had not been sorted out, it had been anticipated that we would return at reduced speed using only one boiler. 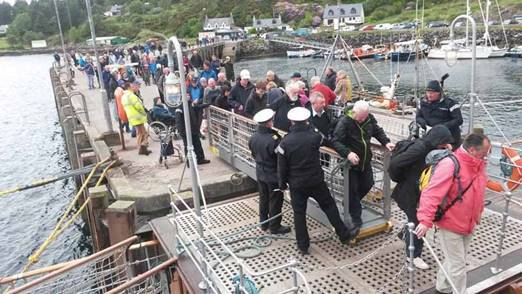 Saturday’s cruise was the regular Tighnabruaich run and was again well supported by a large number of people keen to enjoy themselves as much as possible. These included a ladies’ choir who provided impromptu performances in various locations. Apart from about an hour’s rain between Rothesay and Tignabruaich, it was another fine warm day. The sheer numbers getting on and off delayed the steamer, however. 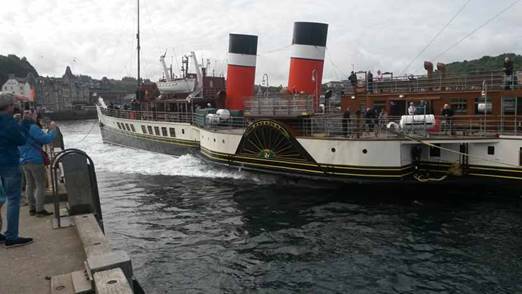 Sunday saw Waverley set out for Lochranza, calling at Greenock, Rothesay, Largs and Keppel (Isle of Cumbrae). There was a good crowd of people on board as we departure at low water. Punching the incoming tide held the steamer back and this, combined with a delay waiting for the rope men at Rothesay, meant that we arrived at Lochranza simultaneously with the Claonaig ferry Catriona. This new ferry is longer than her predecessor and it is now impossible to berth at the pier while she is on the slipway. So, we had to patiently await her departure to complete our voyage. In order to maintain the return time, we only came alongside the pier long enough to take on board supplies of cake for the crew, supplied by a local supporter. On Monday morning the new workboat used to turn Waverley failed to start on time and so Captain Cochrane decided to turn the paddler using a cant rope. It was quite a long process to run out the line and get it secured on the quayside. As passengers are no longer permitted to be on board for this kind of manoeuvre, we all had a grandstand view of the proceedings from the quayside. Naturally, the workboat came into sight just as the crew started hauling in the cant rope! After the exercise was completed, boarding commenced and the steamer finally set sail about 45 minutes behind schedule for Kilcreggan, Dunoon and time ashore in Rothesay. The latter was slightly reduced to help make up time but adverse tidal conditions held her back on the return leg. 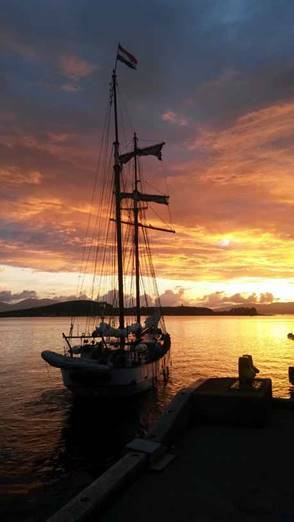 The forecast for Tuesday’s positioning voyage from Glasgow to Oban had indicated a strong westerly wind but fortunately the wind did not in fact rise and the trip went ahead as planned, departing Pacific Quay at 0700 and arriving in Oban at 2030. Calls were made at Campbeltown to pick up more passengers and at Colonsay for a 30 minute break. The weather was cold but the only significant rain fell at Colonsay. The weather was warm and sunny the following day as the steamer departed Oban at 0900 for Armadale direct. On a calm sea, excellent progress was made and reduced speed was all that was required to reach the Skye port on time. Only about 50 souls had been on the vessel on her positioning voyage but a further 150 or so joined for the afternoon cruise to Inverie and back. This gave 1 hour 45 minutes ashore on the Knoydart shore, longer than planned to fit in with revised ferry times at Armadale. Inverie is a small settlement on the mainland which is not connected to the national road network. All supplies are brought in by ferry from Mallaig, as indeed were ice creams during our stay. After dropping off the afternoon cruise passengers at Armadale, the paddler completed her move to Kyle of Lochalsh where she moored for the night. Thursday saw the paddler head further north to Portree on the Isle of Skye and Gairloch on the mainland coast. The sky was grey and gloomy but fortunately there was not too much rain. There were good numbers through the day, reaching a peak of over 600 on the cruise out of Gairloch to Loch Torridon. 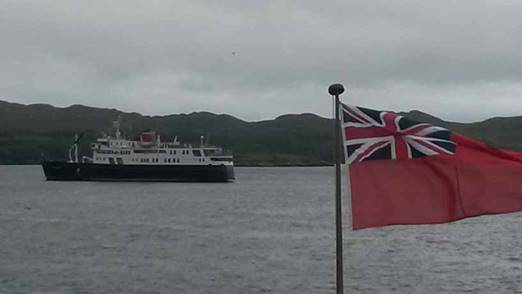 We encountered Hebridean Princess anchored off Gairloch and proceedings were enlivened when one of our regular passenger got left behind as we started our voyage south. I am pleased to say she safely made her back by taxi and train via Achnasheen. 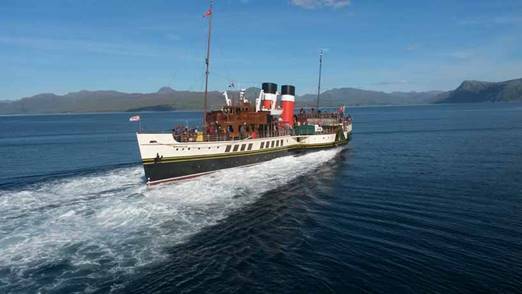 Waverley was again berthed for the night at Kyle ready for her trip the next day to circumnavigate the Isle of Raasay. On our arrival at Raasay Pier there were no rope handlers, so we steamed slowly in a circle while an urgent phone call was made. The second pass was successful, our ropes were taken and we exchanged passengers. We steamed on to Portree where a good number came aboard. Then disaster struck! While going astern to clear the harbour, a wire cable became snagged in the port paddle wheel and wound itself around the paddle shaft. The ship lost power and the anchor was dropped while a preliminary assessment was made. A low speed movement was deemed possible and the steamer slowly moved to a safer anchorage where the cable could be removed. This process took some time and an inspection showed that a reduced speed passage could be made. It was now too late to do anything but retrace our course to Raasay and Kyle. Captain Cochrane decided not to attempt a return to Portree in case of a repetition. Further checks were made while passengers were exchanged at Raasay and then the steamer continued south at around 10 knots. Arrival at Kyle was earlier than planned but nevertheless the Lochalsh Junior Pipe Band was again in attendance, welcoming us with ‘Scotland the Brave.’ The Portree passengers were coached back from here. The positioning voyage was made at reduced speed without passengers, arriving after midnight. The 50 or so Western Isles Pass holders made a variety of arrangements to get to Oban. 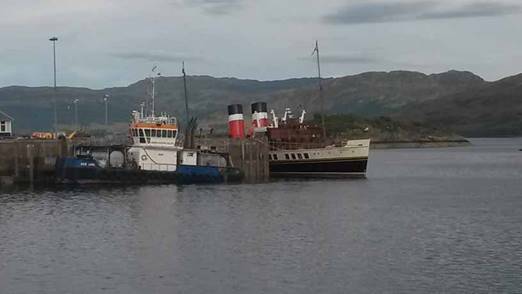 Saturday was spent undertaking repairs alongside Oban’s North Pier with assistance from staff from the Dales Marine from the Garvel dry dock. 7 men worked 13 hours to repair the wheel, the floats of which looked like they had been cut with a cheese wire. Neither the day nor the evening cruise took place. There was a good crowd on board on the Sunday for our trip to land on Iona, including three coach loads from Glasgow. However, shortly after departure time Captain Cochrane announced that the operator of the Iona landing boats had been in contact to say there was too much swell for a safe transfer to take place. There was then a pause while options for a cruise in sheltered waters were investigated. The initial thought had been to visit Tobermory but the pier was not available, so the Captain decided to offer the Four Lochs cruise that could not be given the previous day. A number of passengers opted to leave the steamer at this stage and those remaining were offered suitable refunds and half price vouchers. The revised cruise went ahead under gloomy skies but there was not too much rain although there was a stiff southerly breeze from time to time, as the paddler twisted and turned to visit Lochs Shuna, Melfort, Craignish and Crinan. Then west to pass through the Gulf of Corryvreckan where, I am glad to relate, the whirlpool was not running. We were now in the open sea and experienced a period of rolling in the westerly swell, the very conditions that prevented the visit to Iona. We returned to Oban just after six o’clock, once North Pier had been cleared by the veteran tall ship The Flying Dutchman of Amsterdam. 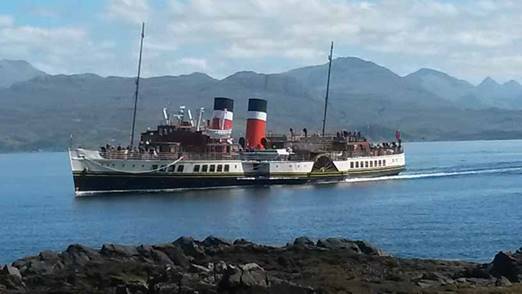 The final day of the Western Isles season, Monday 5 June 2017, took Waverley from Oban to Tobermory and Tiree with a short cruise to the Gunna Sound, which lies between the Isles of Coll and Tiree. The steamer was quieter than on the Sunday but the weather was much more pleasant with quite a bit of sun with the briefest of brief rain showers. More passengers joined at Tobermory for sail past the Ardnamurchan light to the Isle of Tiree. There were distant views of Rhum, Eigg and Skye. Soon we were passing both the Isle of Coll and CalMac’s Clansman, inbound for Oban. The majority of the passengers disembarked to enjoy a brief spell on the Atlantic island while we were joined by a throng of islanders, including the children from the primary school. As we turned in Gunna Sound we could see the island of Barra in the far distance and our thoughts turned to the funeral of Eilidh MacLeod which had taken place there earlier in the day. Eilidh was a 14 year old victim of the Manchester bombing. 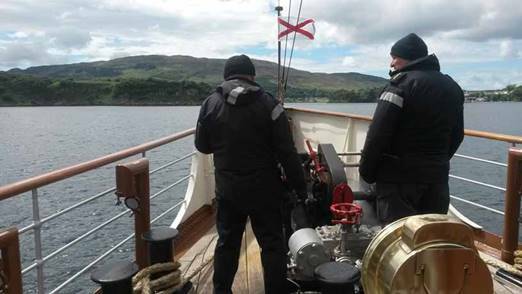 Just before we docked back at Oban, Captain Cochrane made an announcement to mark the end of the short season, thanking both crew and passengers for their support and looking forward to Waverley’s 70th anniversary cruise on 16 June. 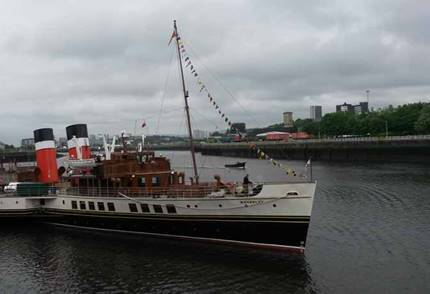 The steamer had been chartered privately for the next three days, so there was no public voyage back to The Clyde this year.